I know you are always looking for simple, low mess activities for the kids that keep them busy and will help them let loose their creativity. Plus, here’s a bonus for you: it will get their bodies moving. chalkboard. 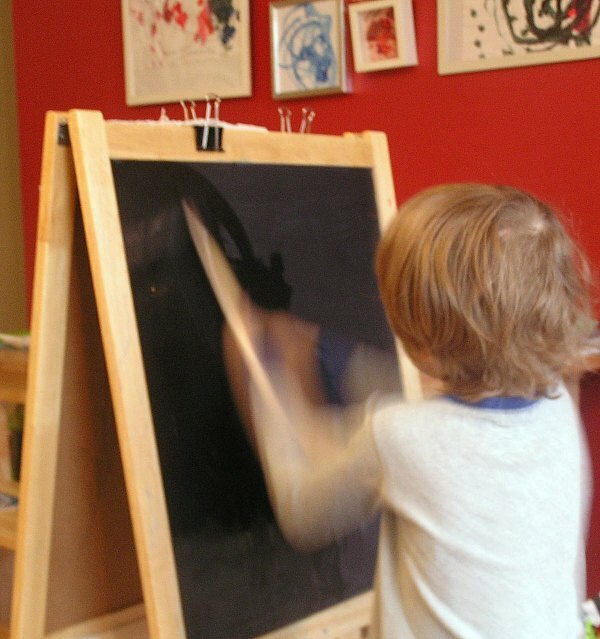 Since we live in an apartment, we have a simple easel like this one set up for spontaneous art projects. Can you figure it out yet? Water creates wonderful, temporary pictures or designs. Kids get to watch their art appear and reappear before their very eyes. My son spent an excessively long time doing this and I think this photo above demonstrates his enthusiasm better than I can describe with words! Don’t go yet. Here’s another idea! If you can, get outside to paint with water on the pavement–sidewalks, driveways, patios–wherever! Watch the sun dry up your drawings, or wash it away yourself with a spray of the hose. Alternatively, kids can draw with sidewalk chalk and then paint it away with water! YES!! My kids LOVE this activity. So simple and so wonderful. They also enjoy painting the wood fence with water in the summer. It turns a nice shade darker, very satisfying. Plus, no clean up makes me pretty darn happy! I love the fence idea! Sadly, we have only a fire escape and no yard. 🙂 But it would be fun to take to the park and paint all over the paths!